Finally got to see "9," Yay! 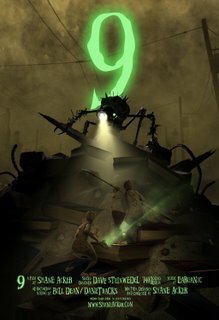 I went to a screening of "9" last night, and Shane Acker was there to talk about his work. I was so happy to finally get to see it in it's entirety, previously only having seen the trailer. It was a very inspirational evening, and Shane was a really cool guy and a talented artist, with a unique vision. I'm really anxious to see how it will translate to a feature length film. Check out www.shaneacker.com.